He sits facing the camera, legs crossed. A stripe runs down the outside of the pants leg. His left hand cradles a revolver while his right holds a Bowie knife against his shoulder. A jaunty striped collar sets off a strong head with dark, wavy hair and a fringe of beard. I notice the eyes, intent and knowing. They are different sizes, the left slightly smaller than the right. I have the same eyes. This is my great grandfather, John Thomas Dixon. 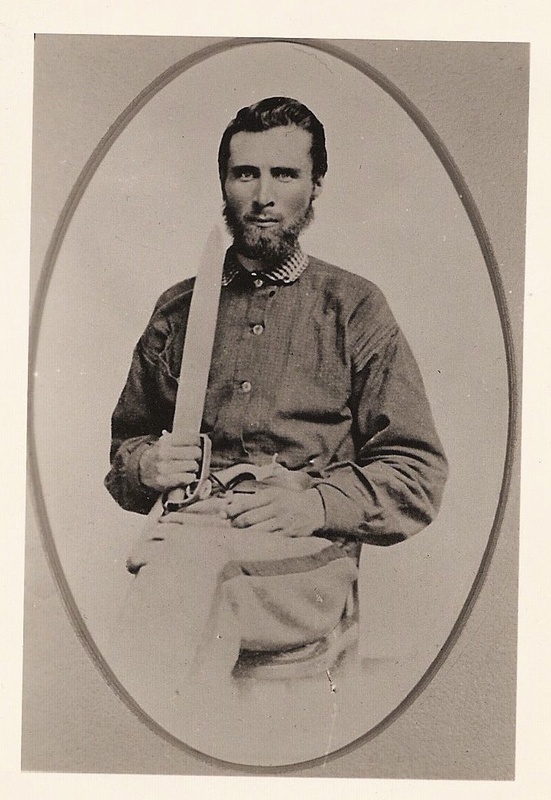 Most of his life he was a tobacco farmer in Charlotte and Prince Edward counties in Virginia but from June or July 1861 to April 23, 1865 he was a Confederate soldier, 56th Virginia Infantry. He fought in many well-known battles but his greatest claim to fame, if only in our family, was that he was wounded in, and survived, Pickett’s Charge. I grew up hearing this story and caught on early, before I knew anything about the Civil War, let alone Gettysburg, that to have survived Pickett’s Charge meant something. The story stayed in the realm of oral history most of the time, talked about at family reunions when someone wanted to muse about the “War Between the States.” My father would tell the story, or my uncle. I often thought I should write it down. As a southern ex-pat living in the north, I tried to embue my children with a sense of their southern heritage, with mixed results. When she was in 7th grade studying American history, my daughter was given an assignment to write an essay from the point of view either of a Union soldier on Sherman’s March to the Sea or a Confederate soldier in Pickett’s Charge. When she chose the Union soldier, I intervened. So she wrote her essay on her great-great grandfather but though what we learned satisfied the requirements of a 7th grade essay I still knew little about the man and his military record. All that changed this summer when my friend Mark, an historian of the Civil War, learned of my ancestor. I realized how little I actually knew, so I consulted my cousins, one of whom located a written account of our great-grandfather’s life, along with his picture. The military details – Company I, 56th VA Infantry, Garnett’s Brigade, Pickett’s Division, Longstreet’s Corp – meant nothing to me but everything to Mark. He sent pictures showing me the path Garnett’s Brigade had taken, how far they had gotten, and where they had been repulsed. Last week I went to Gettysburg myself and Mark met me there. He showed me monuments, rocks, trees, and where things happened. He took my picture where Garnett’s brigade crossed the wall. My great-grandfather was not with them, for he had been wounded in the shoulder and perhaps also the leg somewhere in the field. There is no way to know how close he came to the stones I chose to sit on. All through the day I tried to reach through the intervening years. There was a part of me that had hoped to see a ghost or at least to feel an evocative shiver, but I did not. I studied the paintings that recreated the ferocity of the battle, then looked up at the same landmarks and saw beauty and tranquility. That is the mystery, that such a land could have seen such horror. But I did not dwell there. I was born because my great-grandfather survived that day. I had not seen Mark since high school. The day was for the living. I really identified with your experience described here, not because I am aware of any direct connection with Gettysburg, but because one of my great-grandfathers, Nathaniel Archer Dowdy, was also a Civil War veteran, about whom I know very little. Born in the small mill village of Ca Ira, VA, along the Willis River in Cumberland County, he enlisted in F Company, 21st Regiment in 1863 at the age of 18. A couple of years ago, I traveled to Point Lookout, now a quiet state park in Maryland. There was little there to give me a real sense of what his time there may have been like, though some information makes it clear it was miraculous that he survived. I wondered how he made it back home, now almost 180 miles and predicted to take almost 4 hours by car. His will to get home must have been intense. It still feels strange to me to realize that such a relatively short genealogical gap separates us from such a distance in history. Hi Linda, I stumbled across this article and your reply and was pleasantly surprised because we share a common ancestor although indirectly. Nathaniel’s first wife was a great, great, great aunt. I have records pertaining to NAD because he sold property to my family and served in the war with his brother in law. I’ll be happy to send you a copy if you don’t have them. What a delightful surprise to get your message today. I had known that Nat married twice (I’m a descendant through his second wife, Carrie … or rather, Martha Caroline, born a Dowdy, too), but have never met any of the descendants of his first wife. If I read correctly, his first wife was also born a Dowdy. We have assumed that there was some level of cousin-hood in all of this, but I haven’t quite figured it out. If you can send me copies of those records, I would be very pleased. Where do you live? I have made several visits to Ca Ira in recent years, and found the gravesite in the woods, where NAD and Carrie are buried, along with a number of other relatives. The cemetery is in the woods now, though one of the Richmond cousins & I figured out that perhaps when the space was first used as a cemetery, back in the early 1800’s, the land was probably cleared, and overlooked the Willis River, and perhaps even the mill below. And I have copies of a couple of photographs of Nat & Carrie … not sure of how to attach them on Susan’s blog. By the way, how DID you stumble across this blog & my comments? Linda, I’ll be happy to email you the documents; however, your email address doesn’t show up. Please write me at apollo7000@hotmail.com. This is a compelling account and a fine tribute to your ancestor. Good for you! Susan, I got to your blog after researching John Thomas Dixon. I am a Civil War photograph collector and recently acquired an albumen copy of your great grandfather—identical to the one you show. I myself lost my great-great grandfather Joseph Nathaniel Londeree at Harper’s Ferry. He was in the Confederate Lecher’s Artillery under Stonewall Jackson; and I stood where his artillery unit participated in the battle of Malvern Hill outside of Richmond and got the same shivers that you experienced at the Gettysburg battlefield. I felt the ghosts. Great description by you. I wonder who owns the original ambrotype or tintype of Pvt. Dixon?? Bill, why were you researching John Thomas Dixon? How did you know about him? I had purchased the identical photograph of him, identified in Military Images magazine. The photo also came with his Confederate Army muster records. My grandfather is William Denny Dixon and my father is Richard Dixon. I truly enjoy reading your blog. I have heard the stories of John Thomas Dixon, but seeing this photo for the first time was really incredible. Thank you for sharing, and maybe we will run into eachother one of these days. Taylor! How cool is this? I know your grandfather would have approved this investigation. I email with your dad from time to time – tried to get him to come with us to Viet Nam, even. Thank you so much for finding the blog. Keep in touch, please. Hi Susan. Sorry for the space between communication. I continue to follow your entries and your adventures. Thanks so much for sharing and keeping up your wonderful site. Hope to share a story or two in person one of these days. Susan, Bill again. I have decided to sell my albumen photograph of your great grandfather John Thomas Dixon. I will post it on Ebay under my seller name- talipes. Did you sell the photo or do you still have it? I hope you will share stories, Taylor! I look forward to hearing them. BTW, do you – or anyone else – know where John Thomas Dixon is buried? I can’t find that in the family account I have. I do not know. I will ask Dad this evening if he has any idea. I know we have several family members buried in Richmond, several of them together. Wow! I just found your blog entry about John Thomas Dixon and had to write. We’re related. My Grandmother was Gertrude Dixon. My Mother has all the genealogical info for the family and I will forward the URL for this blog to her, however without having it in front of me, I’m guessing that my Grandmother and your Grandmother/father were siblings. I know that my Mother has some genealogy done around 100 years ago that prominently identifies John T. Dixon and gives similar history to your blog. It also states he was “surrendered by Lee at Appomatox”. I’ve checked those rolls and he’s not on it (the 56th Va Inf’y was decimated at Hatchers Run, about a week before Appomatox). However his parole date is odd. It’s about a month after Appomatox, but well before most of those captured just prior to Appomatox. I’m guessing he was at Appomatox on April 9, 1865 but did not hang around for the formal surrender 3 days later; specifically since he lived only a few miles away. I’ve been to his gravesite which I seem to remember is in/around Charlotte Court House. My Mother will have the exact location. I’d love to share info with you. The picture is a revelation. I’ve never seen that photo (or any other photo) of John Dixon. Is there some kind of provenance? Please feel free to email me direct so we can correspond. I just left a long post but fear I lost it before it successfully posted. If not, I apologize for the redundancy. My Grandmother is Gertrude Dixon. I’ve been ‘tracking’ John T. Dixon as an ancestor for some time. Your blog on him is outstanding. I’ve been to his grave site, which I seem to rember is in/around Charlotte Court House. My Mother would know for sure as she has all the genealogy. I’d love to share info with you and I’m specifically interested in the photo. My family does not have any photographs of him. Is there any provenance for this photo? Are there any others? Please feel free to contact me directly. Greatly look forward to hearing from you. Hi Glenn. Both your comments came through. I’ve got this blog set so the first one from a new visitor has to be approved. After that they appear automatically. Meaning, from now on your comments will appear immediately. OK, that’s the technical stuff out of the way. From what you know, I would guess we are indeed related. I don’t recall a Gertrude Dixon, but I can check some genealogies later today. I remember stories about John Thomas Dixon being near Appomatox, leaving to go home, and losing his rifle while crossing a river. I am delighted to know where he is buried. I would love to go there. I don’t know any more about that photograph. I don’t own the original. I only have electronic copies. There may be one for sale on ebay (check previous comments on this blog post) but I don’t think that would give you more information. I’m going to check with my Dixon cousins to see what more I can learn. Perhaps we can meet at Charlotte Court House? Sounds good. I’ve been meaning to revisit his grave. I live in Manassas, VA so it’s not that far for me. I found a link to the exact location (see below). He’s buried at Beulah United Methodist in Charlotte County. This link has all the info, to include a picture of his grave. He’s buried in the same plot as his wife, Mary, who died six years before him. I look forward to any other info you can get on the picture you posted (or any other). I would dearly love to have a quality digital scan or ‘orignal’. I may even have a painting done. Susan, what a shock it was to find ths site. I am Melvin Thomas Dixon Jr. John was my Great Great grandfather. I have only recently started to research his and the rest of the famiies past. 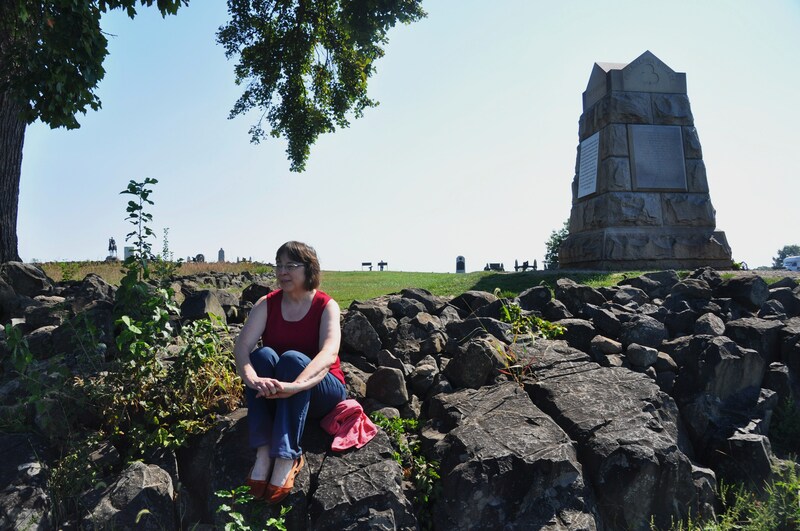 I have always wanted to walk around Gettysburg Battlefield park and tour the area where you had your posted picture taken. The “Copse of Trees” and the “Angle” are where some of the heaviest fighting occured. My grandparents were Aubrey and Edith Dixon. They lived in Richmond Va until they passed some years ago. I have some JTD,s information from the National archives. It is mostly his monthly pay receipts ($11.00 a month). It also has his furlough for 40 days due to wounds he suffered on June 16 1864. I have found no mention of him being wounded at Gettysburgh or Antietam. I am a retired US Army Officer and in studying Antietam and Gettysburgh I have no idea how he survived. If you would like a copy of the files I have I will be glad to send them to you. I have a brief breakdown of the family tree which I can scan and send you also. It was a pleasure finding you. Melvin, how wonderful to find you via this blog post! You must be a cousin of some kind. My grandparents were John Wesley and Margaret Denny Dixon. Have a look at the previous comments – you will see other cousins as well. Looks like it is time for a reunion of the descendants of John Thomas! I’m working on a video showing photos of Confederate soldiers and their stories. I would like to know as much as I can about your ancestor. Like what company was he in? Oh and by the way I happen to be a Confederate re-enactor with the 56th Virginia and I’m proud to represent a member of his regiment. Let me think about this for a few days, Michael. In light of recent events I had a blog post brewing anyway. This may prompt me to clarify my thoughts. You are currently reading Survivor at Susan R. Dixon.